Get ready for everyone’s 2nd favorite bounty hunter. 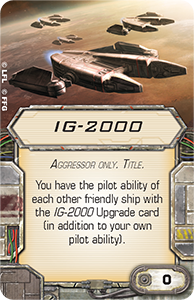 The IG-2000 is hitting a tabletop near you soon. The Aggressor is no freighter, shuttle, or support ship. It’s a powerful assault fighter designed expressly for space combat and loaded with potent power cores and weapons systems. 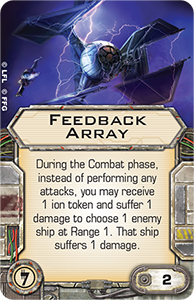 In X-Wing, the Aggressor is an agile, tough, and hard-hitting fighter with a balanced stat array of three Attack, three Agility, four Hull, and four Shields. 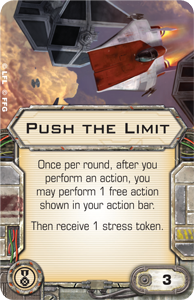 Additionally, the Aggressor’s action bar features the focus, target lock, and evade actions, as well as the boost action, making it the first large-base ship in X-Wing to feature the boost action natively. All these stats and actions make the Aggressor an intimidating fighter to have bearing down upon you, but the real key to the ship is its loaded maneuver dial. The Aggressor is able to perform every single straight maneuver, bank, or turn at speeds “1” and “2,” and most of them are green. Then, at speed “3,” the Aggressor features three green maneuvers, one straight and two banks, as well as two Segnor’s Loop maneuvers. 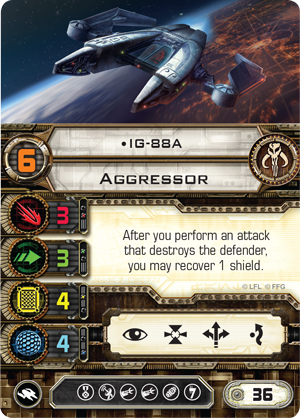 Finally, the Aggressor also features a speed “4” Koiogran-turn. 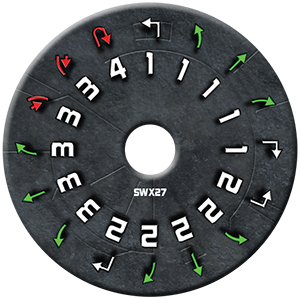 Altogether, the Aggressor’s fully loaded maneuver dial ensures that you’ll always have one or two good maneuver options. Your opponent will never know exactly what to expect. On the other hand, you’re going to need all the maneuverability and element of surprise that the Aggressor offers because it only features a forward firing arc. You don’t have a turret weapon or rear firing arc to help you compensate for botched maneuvers. 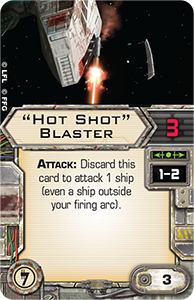 Certainly, you can use your illicit upgrade slot to equip a “Hot Shot” Blaster or Feedback Array. 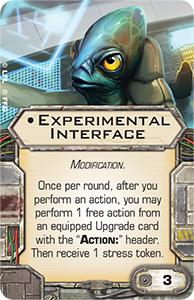 However, you’ll still want to focus on your flying, as these upgrades are for limited use only. 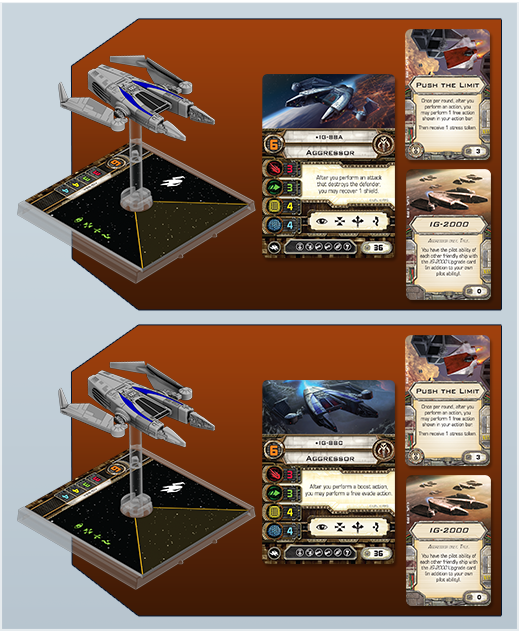 In many ways, then, the Aggressor is the first large-base ship that’s all about its maneuvers, and that might just make it the most “natural” of the large-base ships yet to arrive to a miniatures game that is – at its heart – all about outmaneuvering your opponent in order to get the ideal shot. 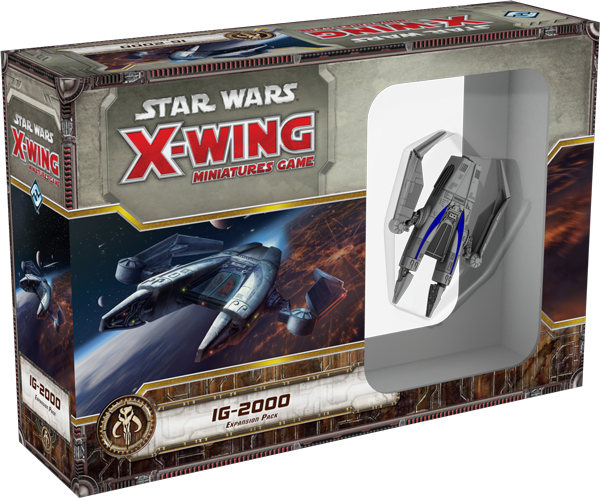 The IG-2000 Expansion Pack comes with four ship cards, all of which present different, unique models of the deadly assassin droid IG-88. 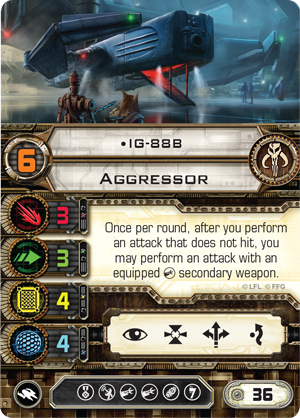 Each comes with a pilot skill value of “6” and costs thirty-six squad points, but the four models are clearly differentiated by their unique pilot abilities. As assassin droids, all the different IG-88 models are excellent killers. However, IG-88A also boasts a unique pilot ability that allows him to excel not only at killing, but also at surviving. Each time he destroys an enemy, IG-88A recovers one shield. IG-88 earned a reputation as a bounty hunter who always delivered, and this consistency is reflected in IG-88B’s unique pilot ability, which functions almost like a built-in Gunner. 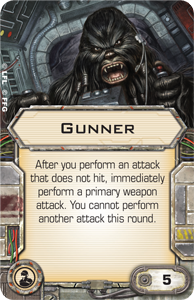 Once per round, if he performs an attack that does not hit, IG-88B can perform an attack with an equipped cannon upgrade. 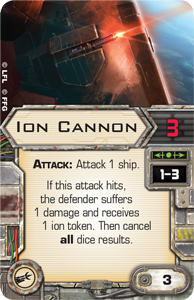 Notably, you can use the same cannon twice, so if you miss, for example, with an Ion Cannon, you can fire that Ion Cannon again, aiming for a better result. 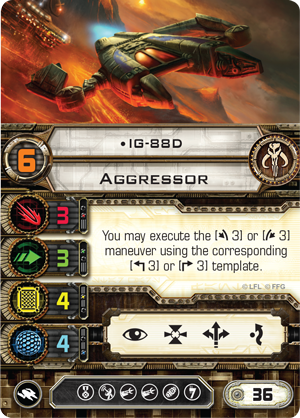 IG-88C is the slipperiest of the four models, gaining a free evade action each time he performs a boost action. After all, despite all of his strength and armor plating, it was the speed and scope of IG-88’s superior intelligence that truly made him such a lethal threat, and if he’s equipped with Push the Limit or Experimental Interface, IG-88C can perform as many as three actions, easily clearing his stress token each round by performing one of his many green maneuvers. The fourth and final of the IG-88 models, IG-88D adds two more maneuvers to the Aggressor’s already astonishing dial. However, IG-88D’s ability goes beyond the mere addition of two three-speed Sengor’s Loop maneuvers; it allows him a choice at the moment he executes his maneuver. Accordingly, if he has a higher pilot skill value than his target, IG-88D can subtly adjust his maneuver from a three-bank Sengor’s Loop to a three-turn Segnor’s Loop. In turn, this may give him the edge he needs to catch a rival within a firing arc that otherwise may have just missed. Finally, as deadly and talented as each of these IG-88 models are on their own, the IG-2000Title upgrade allows them to link their abilities. 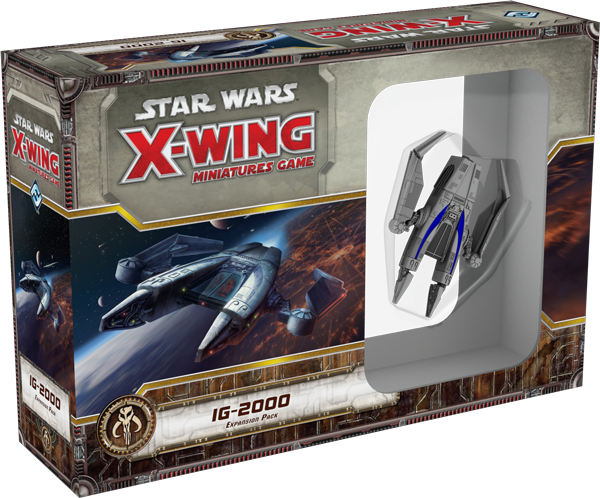 Accordingly, we’re likely to see a number of solid squad builds that feature two copies of the IG-2000. Imagine, for example, the staying power that you’d gain by linking IG-88A’s ability with that of IG-88C. Equip both with Push the Limit, and you’ll have two high-powered ships that can potentially boost, evade, focus, and recover shields round after round. Alternately, you could link IG-88C with IG-88D and equip both with Advanced Sensors to field a starfighter duo whose maneuvers will be nigh impossible to predict. 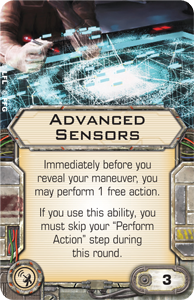 In this example, IG-88C uses his Advanced Sensors to perform a boost action before revealing a three-speed Segnor’s Loop. 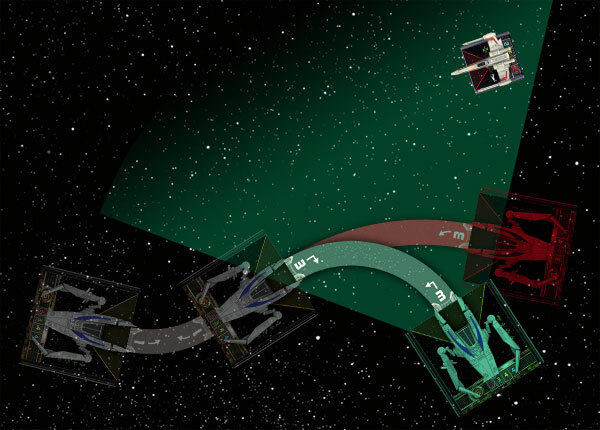 Realizing his maneuver (shown in red) would fail to catch the X-wing within his firing arc, IG-88C uses IG-88D’s ability to perform a three-turn Sengor’s Loop (green), which catches the X-wing in arc, allowing him to shoot for the kill. No matter which combination you choose, or even if you run just a single model of IG-88, you’re certain to find plenty of tricks among the potential combinations of pilot abilities and upgrades. Then, it’s up to you to use these tricks to outmaneuver your opponent and line up the perfect shot. 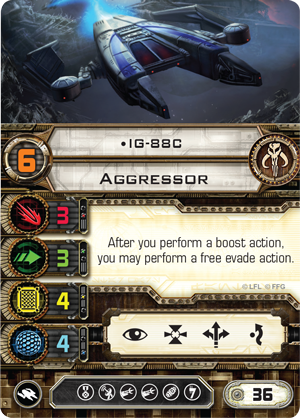 Every bit as deadly as its pilot, the IG-2000 is a perfect blend of attacking power, agility, and resilience. With its myriad maneuver options, it’s also the perfect large-base ship to fly about the battlefield in an unpredictable fashion. Keep your opponent guessing. So, do you think Boba Fett can take him?